I received a sample box of Divine Chocolate this week. In the past 24 hours, I have divulged in what some people may refer to as Heavenly Bliss. I've tried a 70% dark chocolate bar with raspberries that is not just mouth watering, but beyond delicious. The chocolate is high quality and not too dark -it's not bitter either, it's smooth and not overly sweet. The raspberries add an airy crunch and a tartness that gives a richness complexity to something seemingly simple. 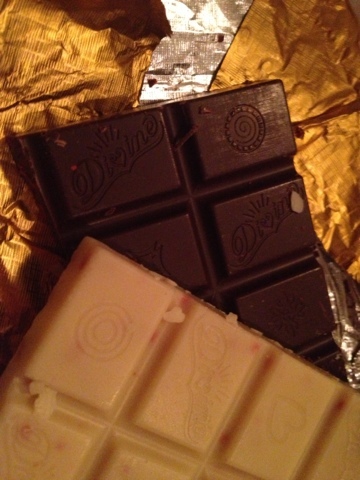 I'm also a fan of very good white chocolate - and Divine combines theirs with strawberries. Again, the textures and flavors are spot on perfect. I have an opportunity to give away THREE of these gift packs, too! I'll post details this weekend and also post more reviews of some other chocolates... Trust me: you will WANT to enter the giveaway!! What's divine is mine, but you can have some too! Stay tuned!